One of the world’s great folk harp pioneers, still going strong. And that harp is simply amazing. If you want to hear all the truly unique sounds Alan Stivell can get a harp to make, go out and buy one of his CD’s. You won’t regret it. Rex James Bros with Mark playing Auld Lang Syne on custom built Harp Guitar, Archtop Guitar, and Octave Mandolin. 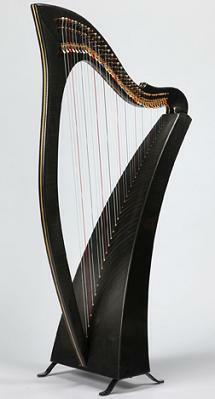 This is so totally going to be my next harp – as soon as we finish paying off the addition. Well, maybe this and a nice little Lewandowski Romanesque harp on the side. Hey, I can dream, can’t I? (Click on the picture to visit the Delight on the Heartland site). Ten pounds! Just think of how much easier it would be, trudging across fields and golf courses to get to the bride’s ideal wedding location. Don’t get me wrong, I’ll still love my wooden harps, but this way I get to love them in nice safe, dry locations. With a nigh-indestructible harp, just think of the possibilities! Oh, the places we’ll go… I’d definitely pick another colour than black though. Maybe midnight blue, or neon purple, or ocean green. The harp guitar is one of the few oddball hybrid instruments to stand the test of time. Depending on when you mark the first occurence of a “true” harp guitar, it’s been around in one form or another since the 18th/19th century (also in early forms as the “harp lute”). harpguitars.net – As its name suggests, a site dedicated to harp guitars. Includes explorations into the instrument’s history and the entymology of the term “harp guitar”. myspace.com/andymckee2 – More music by Andy McKee. See also Andy’s profile at Candy Rat records.